As I was on vacation, I picked up my sister’s copy of Sherlock Holmes stories, and quickly I got caught up in the really really beautifully narrated and well thought-out plots. As I had my phase of obsessively playing the classic LucasArts adventure games, the very first Holmes story “A Study in Scarlet” led me to think about the adventure game genre. It should be no news to you that the basic design of adventure games is largely the same as it was 20 years ago. Which isn’t bad. Those games, as I said, were gems and the old design patterns, if well implemented and with a good amount of creativity, do lead to an enjoyable gaming experience. I’m kind of a sucker for the whole non-linearity subject, as you might have noticed looking at my other blog posts. 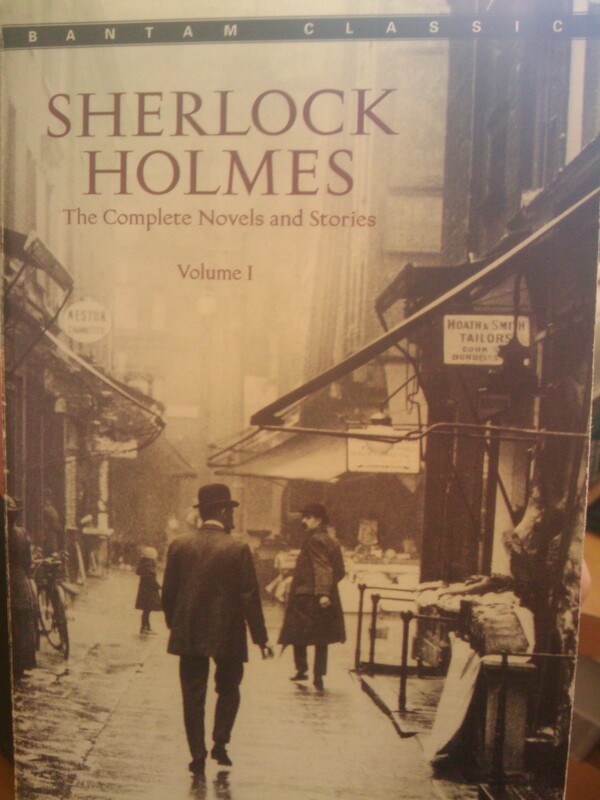 In “A Study in Scarlet”, Sherlock Holmes is first introduced to the reader by the narrator and companion Dr. Watson. It is through his eyes that we perceive the story and Holmes’ actions, not counting in the second part that explains some of the necessary background of the plot. What I find so interesting is that Holmes’ skill of observation and deduction is largely the key for his success in uncovering the murder mystery. It’s as I believe a very classic structure. A murder happens, the hero (Holmes) comes onto the scene some time after the incident happened, searches for clues and goes off making his deductions and conclusions. In between, there is enough space for interrupting events and twists in the plot that can lead to the need to change the theory of the detective, or that can help flesh out and advance the theory. In classic adventure games, we have a very linear path of puzzles thrown at the player. The player is exposed to a new setting, often introduced with a cut scene to the goal and obstacle. What the player must do then is get to know this new environment, talk to characters, pick up items and soon he/she will run into things blocking the path, often more than one at a time leading to complex interconnections of more or less independent puzzles. It’s almost always the question of “What did the game designer want me to understand so that I can find the trigger to advance the narrative?”. It’s trigger that sometimes puts me off, because in a badly designed game, it can end up in senseless actions being asked of the player and therefore he/she gets stuck for no valid reason. With good puzzle design, this can be minimized, but still, it all puts the player’s range of action into an uncomfortable corset. If I should make “A Study in Scarlet” an adventure game, it would start off with a cut scene introducing Holmes and Watson, with Holmes explaining the importance of observation and deduction. The player would get into control of Holmes at the arrival at the scene, where the player has laid out in front of him a reasonably small area full of clues that the player is expected to find by him/herself but it would not be totally necessary to find all clues. The thing is that the city of London simulated in the game, or rather the necessary portion of it. There would be citizens and policemen each one a unique character going about their daily business in real time, and the player being Holmes, can go anywhere at anytime and talk to any person, provided they aren’t sleeping or otherwise busy, all in the realm of believability. Holmes is allowed to detain anybody but would lose points or suffer another kind of penalty for false detainment. In the story, the murderer is a cab driver called Jonathan Hope, and Holmes catches him completely off guard, after Hope managed to kill a second person. In the game, if the player for example solved the story before and knows when and how Hope strikes again, he/she would be able to catch Hope red-handed, this being a logical consequence of the non-linear nature of the game. It’s all about the player him/herself making connections using the clues given and taking action accordingly. In the story, Holmes finds out the name of the murderer by telegraphing with a previous staying place of the first victim (which he knows by a piece of paper on the corpse), at which the other person informs Holmes that the victim took protective action against Hope back then already. In the game, upon learning the name of the victim, Holmes would be able to do this as well, and get the same information. The fact that Hope was a cab driver though, is purely a theory of Holmes, based on the idea that the murderer was poor and needed to stalk his victim, so the occupation of cab driver would have been fitting with the other theory that the car traces found at the scene were traces of a cab. Again, the traces themselves were typical for cabs, not normal cars of private men, which wouldn’t be expected of the player to know, so here we might have Holmes give an audible clue himself to the player by muttering to himself during the initial clue-seeking. This design paradigm consists of the basic idea that the player should be able to solve a problem by using their own brain power instead of hunting for triggers. Triggers are a more primitive way of the designer forcing the player to think, sadly resulting in use-everything-with-everything orgies if badly done. A non-linear approach allows the player to make mistakes and encourages the player to make their own conclusions and gives them the power to execute on them. Of course a autonomous world to do that in is awesome already by itself and it should allow for pretty new motivation to replay an actually linear plot line if it was not for the player :D.
I’m aware that this is heavily focusing on the detective/mystery sub-genre. I don’t mean this is the Next Big Thing in the entire adventure game genre and in the future all games should be like this, but games designed and made this way might bring some fresh air into the genre, do you agree?